The Shiras Moose also known as Wyoming moose is the smallest of North America's moose however it is still quite large. The Shiras moose are found in Wyoming, Montana, Idaho, British Columbia, and in isolated areas of Utah, Colorado, and Washington. 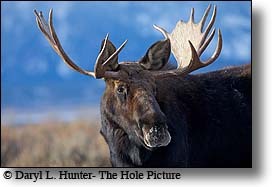 The Shiras Bull Moose has smaller antlers than the Canada moose. Its body color is a rusty-brown to black with pale-brownish saddle and its legs are gray to white. The Shiras cow moose are slightly smaller than the male and does not have antlers. The bulls can grow to seven feet tall at the shoulder and can reach10 feet in length. Mature Shiras Moose weigh 600 to 1400 pounds. The cow moose weigh between 500 and 1200 pounds. Bull moose have antlers that can span five feet and weigh up to 50 pounds. 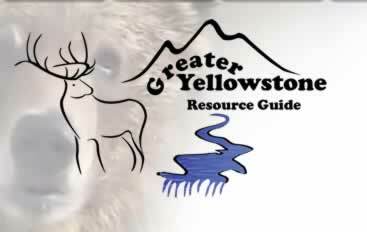 Moose hunting in the Greater Yellowstone Region is by permit for both residents and non-residents. Moose hunting success is universally high in our region, ranging from 80 to more than 90 percent. Wyoming is the leader in the number of permits issued and the number of bulls in the record book. 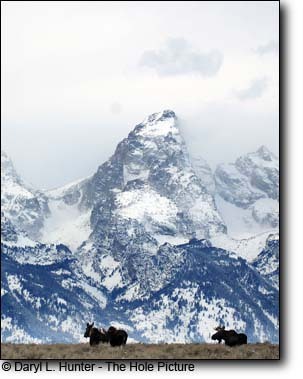 The Grand Tetons, The Wind River Range and the Absaroka Range are all fantastic places to hunt. However, Idaho has a productive Moose hunt also. About half of the moose in Idaho are harvested in Big Holes, the Grand Tetons, The Centennial Range and the Caribou range of southeast portion of the state, while 40 percent are killed in the Panhandle/Clearwater regions, with the remaining 10 percent from the balance of the state. Montana has great hunts in the Gallatin, Absaroka and Madison Mountain Ranges although the moose population there has been dwindling since the introduction of wolves. Hunting is most productive early and late in the day when the moose are most active as they snooze during the day. 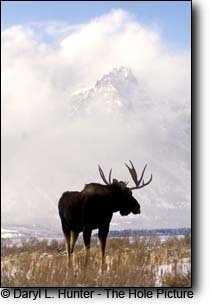 In much of their range, Shiras moose can be hunted on public land without a guide except in the Wyoming designated wilderness areas. 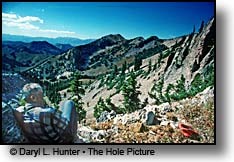 When hunting for moose look both on the forested lowlands, lower mountain elevations and canyon bottoms. They can often be found in or near water, grazing on aquatic plants or willows. When you find a promising area, head out in the mornings and evenings to glass likely spots, such as willow stands, lakeshores, mountain meadows, and other forest openings. During the day, moose climb to vantage points to rest in the shade. During the fall hunting season, keep on the lookout for rubbed trees and pellet-like moose droppings called moose nuggets. Bull Moose begin rubbing in early September, both rubbed trees and moose nuggets are good telltales of the nearby presence of bull moose. Tracking moose is a popular tactic, light, soft snow is ideal both for seeing the tracks and moving quietly through the woods. Wherever moose are found in relatively open terrain, spot-and-stalk hunting is a popular and effective. One of the most exciting ways to hunt moose is to call them in, bull moose are particularly active and vulnerable during the rut, all they have is one thing on their mind and it isn't safety. A cow-in-heat call or an antler rattle can draw out a bull. Antler scraping sounds on trees and shrubs can be used in early September. 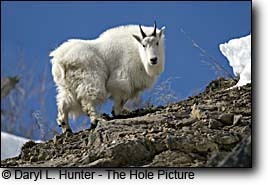 In many areas bulls can also be located or called in by imitating the grunt made by male moose during the rut. Also, aggressive bulls can be brought into gun or bow range by raking trees and brush with an object that sounds like antlers on brush. Another hunting option is by floating in a boat or canoe. This way you can silently put the sneak on them while they are eating or drinking. 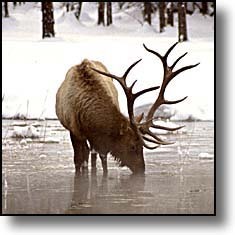 Hunting from the water during the rut has long been an effective way for many hunters to hunt moose on lakes or rivers. When floating a river, the best areas to look for moose include oxbows, off-stream ponds, large grassy flats, islands and any places where the river widens and forms calmer waters. Look for evidence of moose using the area; if fresh sign is present, you've discovered a suitable place to pull ashore and start calling. This is best accomplished by fishing the are extensively ahead of time; multitasking is an invaluable skill. Fishing is an enjoyable way to scout. Still-hunting can pay off as long as your scouting or glassing has given you a good idea that you aren't going to be spending time in the woods by yourself. For many hunters, the best and easiest way to bag a moose is to book a guided trip through an outfitter. Outfitters know where to find them and often add much to the trip as outfitters often are colorful characters that are fun to be around. 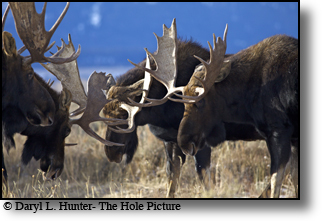 Good weapons for hunting moose include rifles of 300 caliber of better, black powder firearms, and archery equipment. 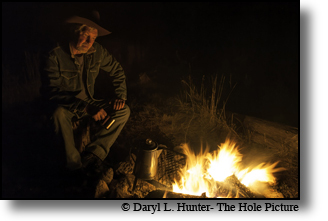 Black powder and archery often give you and advantage of earlier seasons before the general hunt. If you are ever lucky enough to draw a tag for a Shiras Moose Idaho, Montana or Wyoming will surely be the answer to your harvest. 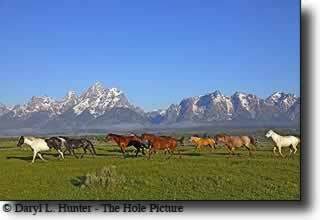 Mill Iron Ranch  (Jackson Hole) Mill Iron Ranch has been a Wheeldon family tradition for three generations. 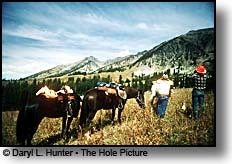 We carry on the old cowboy traditions around here, showing the Jackson visitors how to ride, fish, hunt and camp. Hidden Basin Outfitters • (Jackson Hole) Jackson Hole is home to some of the finest big game hunting on earth, where hunters have the opportunity to pursue animals in their natural habitat. 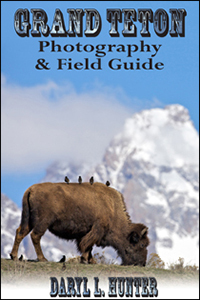 Our experienced and fully-licensed guides will lead you and your party in search of cow elk, bull elk, moose, sheep, mule deer, antelope, and bear. 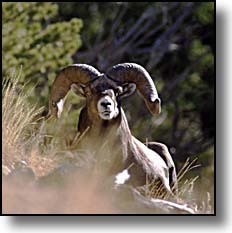 For Big Game Hunters Looking for a True Wyoming Experience!